MyGreenSoapbox: Indoor Air Quality - Can You Breathe Easy In Your Home? Is the air quality in your home making you sick? I read that Australians spend 90% or more of their time indoors, whether that be at home, in cars, public buildings, schools, recreational buildings, restaurants or offices. Are you one of those people? Nowadays, buildings are much more sealed and a lot of places keep windows closed because they have air conditioners either cooling or warming them. Studies have shown that poor indoor air quality can significantly impact on our health as well as creating huge costs to the economy. In fact, the CSIRO estimated that the cost of indoor air quality in Australia could be as much as $12 billion a year! Source: Brown, S.K. (1998) Beating the $12 Billion Cost of Polluted Air. CSIRO Press Release, Ref 98/55. What kind of pollutants can we have in our homes? Well we have all heard about dust mites, fungi and mould but there is much more than that. Most homes also have air toxics such as formaldehyde. Formaldehyde can be emitted from carpet, perfumes, furniture and more. If you want to find out the nasty truth about this carcinogen you can read about it here. Housework can actually be very dangerous! Have you ever stopped to think how many chemicals you release when you open the dishwasher after it has stopped? What about your household cleaners with their poisonous chemicals and toxic perfumes? What do you spray insects with? More chemicals. Have you checked out what is in the personal care products you are using - the deodorants, hairspray and more? Do you merrily puff that talcum powder all over your baby's bottom when you change their nappy? More toxic chemicals to get into those tiny lungs. How do you get rid of odours in your home? Do you spray air freshener - or perhaps you have those plug in air fresheners or the other type that release fragrance? They are all loaded with chemicals - and the plug in type are a fire risk. Add to that a bit of pet dander and a good dose of carbon monoxide and you have the perfect recipe for sick building syndrome. I want you to try this little experiment so you get the picture. Grab some random cleaning agents, personal care products and laundry products and add up all the different chemicals they contain. How many? Did you read the warning labels? Do you know the effects of those chemicals when they are combined with one another or the safe levels for the air or the cumulative effects of constant exposure over many uses? Well you would think someone would know, but many chemicals present in indoor environments have not been thoroughly tested and little is known about their long-term health effects. Stop and think about the implications of that. What we do know is that chemicals used in the house can cause chronic respiratory disease, eye, nose and throat irritation, headaches, aggravation of asthma, eczema and hayfever, lethargy and even cardiovasular disease, poor childhood intellectual development, lung cancer, poor foetal development and more. Can you understand why I jump up and down on my green soapbox about this? I always like to be solutions focussed and provide ways that you can avoid or at least reduce issues that might negatively impact on your health, so here are my tips. Go through your cleaning products and either make your own safer versions or buy products that are definitely organic and not 'green' fakes. Pot plants are nature's air filters and they do a fantastic job of keeping the air much safer in your home. They were really in vogue when I was a young house-wife but you don't seem to see a lot of pot plants in as many homes nowadays. Here is a really great video that is full of useful information and which demonstrates how you can use pot plants to improve the quality of air in your home. If you are thinking about replacing your household cleaners with cheaper, effective and chemical free cleaners then I would absolutely recommend that you get hold of Green Cleaners Quick Cash by Helen Anderson. This book has recipes for making every imagineable kind of household cleaner you would ever wish for. These cleaners match what commercial cleaners do as far as effectiveness in cleaning the house but at a fraction of the cost and most importantly, with no fear of getting nasty health problems. I refer to and use this book all the time. 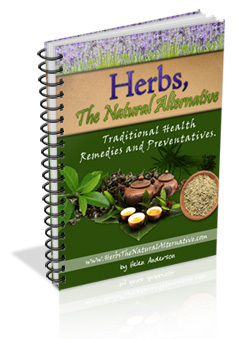 Another of Helen's books that I use constantly is Herbs the Natural Alternative. Relative to this article, there are many ways to replace toxic personal care products through the use of herbs and essential oils. I love this book and have used the recipes for cooking, healing, relaxing baths, candle-making (most candles are highly toxic), mouth washes, body mists and so much more. They are not hard to make, are fun and kind to your household budget as well. I hope you enjoyed this information and hope that you find it useful. If you do, please share it with your friends and family so we can all enjoy better health together. Great article Sonja. Many people are surprised to learn formaldehyde leeches out form their kitchen cabinets (from the laminate and glue). Even though they are presumably at safe (low) levels people are also unaware that these toxins build up in their bodies and are passed onto babies in-utero. Or that combined together have an altogether different effect than seperate chemicals - which are bad enough. Many people also find it hard to get used to having household products without the chemicals because they have the impression they don't work as well. Wonderful post, Sonja! Many people don't realize that through the use of cleaning and personal care products, they are polluting the air around them and breathing in countless toxic chemicals. You give some awesome tips on how to reduce the toxic load in our homes. I myself have not used a "real" cleaning product for years. I clean everything with vinegar, water, and a touch of lemon oil. As for the scent of a home, I use essential oil diffusers and natural air freshener made of orange and lemon oil. I used to use plug ins, but when I found out how toxic they were, immediately stopped. Now I can't stand the smell of them! Hi Joli thanks for your very informative comments. It is wonderful to have another green crusader on board. Hi Robin@CosmeticsDirect thank you so much for the additional useful comments. So pleased that both yourself and Joli shared your sites with our readers as it is good that they know where they can go to find safe and natural products. The split air conditioner is an electronic device that lowers the air temperature through the process of refrigeration or compressor. The split air conditioner is an electronic device that lowers the air temperature, through the process of refrigeration or compressor. Before the summer begin, the thing many of us always think is, if we should contact an ac repair in Studio City to check and repair our unit or even will we have to install ac to get ready for the summer season? The limit (CFM) and the weight of the air compressor are the two most essential details. What are the signs you have to look out for as proof that you need to have your ac repair lewisboro system replaced immediately? Read them below.